The beast that is the Lamborghini Diablo SE30 Jota. If a Lamborghini Diablo is not in your face and making you considering packing an extra pair of pants, one your obviously an exceptional driver and two, you need to upgrade to the rip your face off Lamborghini Diablo SE30 Jota. The SE30 is a very rare car, it was a limited edition, only 150 were made, each one numbered and bearing a special plaque stating which serial number the car had … but within this already very limited production run you could request an even more exclusive car : a Diablo SE30 with a Jota upgrade. The tweaks included a redesigned engine cover with two big air scoops to cool down the highly tuned engine, a similar engine cover would later be used on the Diablo SV model. A very small ‘Jota’ logo at the rear of the car were the only visible differences compared to the original Diablo SE30 model, however, underneath the bodywork the famous V12 engine was tuned to nearly 600 Bhp by reprogramming the LIE electronic injection system. Serious stuff! Depending on what you read where, most sources state only 12 or 15 Diablo SE 30 editions were delivered in the JOTA specifications directly from the factory, however, other sources state that no less than 28 Jota kits were made, this does not necessarily mean that 28 Diablo are now driving around in Jota specs. An open exhaust system was standard for the Diablo SE30 JOTA, but with this configuration, the car was absolutely not street-legal. 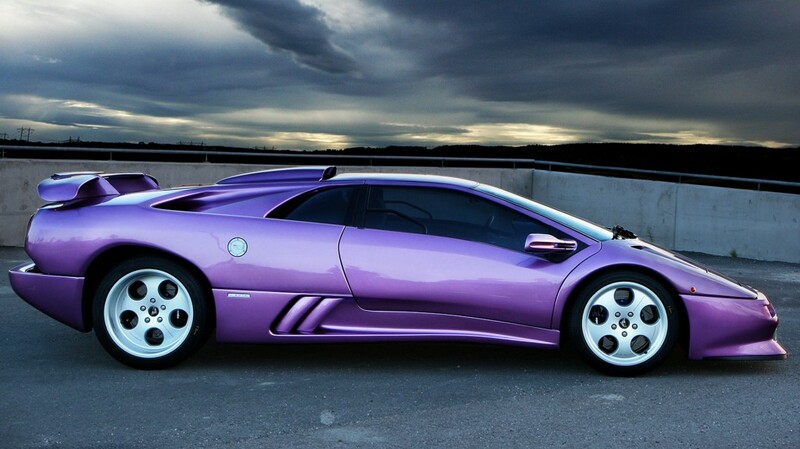 A UK based customer actually had his Violet Metallic Jota detuned because he didn’t like the jumpy engine, so he had a car with the bodywork modifications of a Diablo Jota, but not the performance. With dual air intakes mounted on the engine cover and a massive ‘pressure tray’ on top of the manifolds, the interior rear view mirror became completely useless and was subsequently removed on the Diablo SE30 Jota. Note that the Lamborghini Diablo SE30 Jota was in fact sold with a statement the car couldn’t be used on the road, it was a circuit car only, but it soon became obvious that several cars were actually driven on the public road, probably by installing a different exhaust system. A few of these Jota’s were sold to collectors in Germany and Switzerland, and one Jota was in fact shipped to the United States, where the car was parked inside a collector’s garage and hasn’t moved since, it could never be registered for road use as the car was equipped with the open race type exhaust system as specified by the factory. Production: About 28 Jota kits were produced.